So that’s it – the first week back at work and school are done and to be honest it’s been a tough old week. Not just for myself but for the whole Pure team and some of our clients here in the northeast. The dreaded winter colds and stomach bugs have hit and are lingering around to find their next victim. Our home smells of all the different Young living oils we are diffusing to help aid with breathing and any pains caused by hacking coughs or even just to get a good night’s sleep. Our office is no different with the diffuser pumping out oils day in day out to help where it can. But we have pushed through and we have soldiered on around poorly husbands, ill on the sofa, or upset little ones who just don’t know what they want to do with themselves. We have helped where we know we can by cleaning your home, with our chemical free household cleaners, to eradicate those germs on your door handles and surfaces with its antibacterial elements. We try and find things that help to keep us motivated and push through the groggy feeling from lack of sleep cause by a young one up all-night coughing, which was the case in our directors’ house most nights last week. 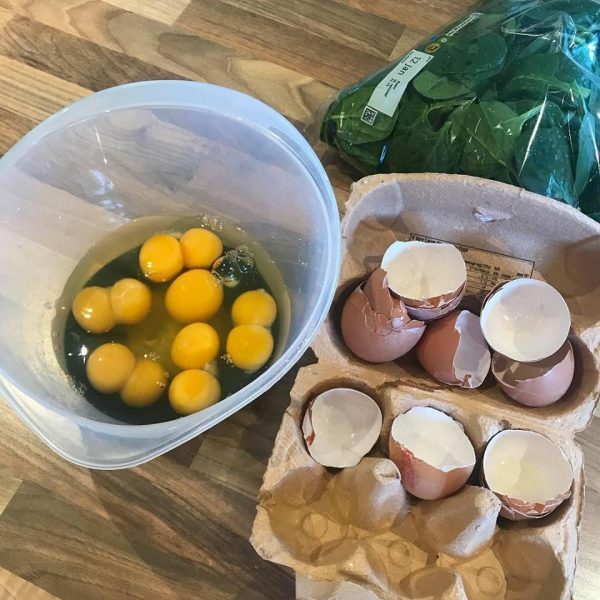 He was given the simple task of making breakfast one morning and upon cracking his eggs to make scrambled egg for the family was graced with his first EVER double yoker! To his delight, and after cracking the second egg, he found it also contained another one – instead of leaving the rest of the box, he carried on using all 6 eggs and getting an astonishing 5 double yokers out of the box – it made his day and yes, he even posted the evidence out of sheer joy! One of my client’s little girls was totally under the weather and just not her chirpy little self, after being up all night with a temperature, but to her the thought of not going to her favourite group or not singing her favourite songs was out of the question. So while mummy got the baby ready we cleaned her room, which she loves to help with every week, her task is to wave my feather duster around like a fairies magic wand before we read a story or sing a song together – last weeks was “we’re going on a bear hunt” with actions and sound effects to help make her giggle and feel a little happier in herself. The smallest things help put a smile on a person’s face and I always say “it’s nice to be nice” it takes nothing out of your day to say good morning or hello to a person on the street. That person may be having the most miserable day, but a smile and a quick hello can spark just a little bit of happiness. So, go forward into January and smile at people, wish them a fabulous day or even simply hold open a door, give up your seat on the train or a bus to a struggling mum or an older person and let make 2019 the year of little random acts of kindness and spread a bit of happiness around……..